Taking the next step forward in enhancing the value of constructed wetlands, a pilot biogas plant to extract energy from the biomass of constructed wetlands was installed on ICRISAT campus recently. Several tons of biomass from constructed wetlands needs to be disposed periodically either through composting or through biogas/biofuel production. Some of the biomass varieties grown on constructed wetlands, such as Typha latifolia have very high productivity (~35kg/m2) and also high biogas potential (~200m3/t) and are better suited for energy production than composting. The plant will help dispose plant biomass from wetlands, agricultural residues and food wastes generated on campus in an environment friendly manner while producing a clean and renewable form of energy which can be used for cooking. Furthermore, the slurry output of the biogas plant (approx. 200 liters per day) can be directly applied to the agricultural fields as a liquid biofertilizer as it contains nutrients and minerals that can be more readily absorbed by plants and thus serves as an efficient soil-improvement medium. Use of untreated domestic and industrial wastewater for agriculture is a significant problem. 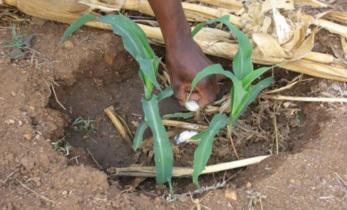 It results in degraded soils due to accumulation of salts and heavy metals thus making them unfit for agriculture and also posing a serious health hazard to consumers. Constructed wetlands help tackle the problem by making the water fit for use in agriculture. This also helps augment the supply of water for agriculture, potentially reducing the overexploitation of groundwater in agriculture. The safe reuse of wastewater for agricultural purposes shows higher crop yields and helps reduce the amount of pollutants in wastewater by 30-92%. “It is very important to keep the nutrient cycle closed for the benefit of the environment and agriculture. This goal can be clearly achieved with the help of innovative initiatives such as a biogas plant to recycle the biomass generated on constructed wetlands and again using the energy for cooking and putting the slurry back into agriculture which aids in efficient distribution and closure of nutrient cycle,” said Dr Chandra Madramootoo, ICRISAT Governing Board Chair, at the inauguration of the plant. 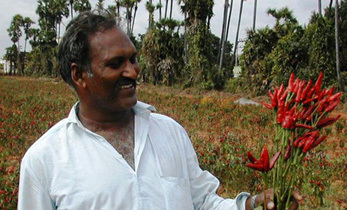 “This is a great example of innovative partnerships between ICRISAT and a private company. Such partnerships are needed to strengthen ICRISAT’s research capacity towards innovative ideas for sustainable and reliable solutions in agriculture and environment. 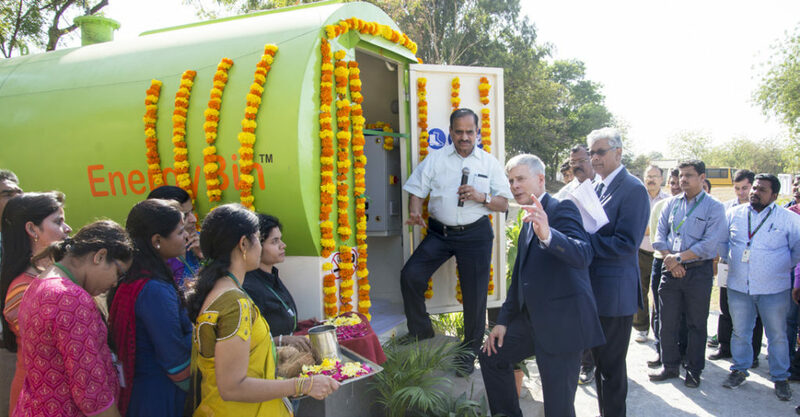 Producing biogas from organic wastes and cooking food using biogas means that we can have clean energy, cleaner homes and thus a cleaner environment,” said Dr David Bergvinson, Director General, ICRISAT. “The biogas plant will be utilized to process up to 100 kg of organic biomass/wastes generated on campus and can produce about 15 m3 of biogas per day,” said Dr Wani, Director, ICRISAT Development Center (IDC) and Research Program Director, Asia. 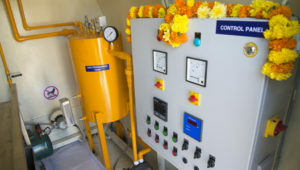 The plant has been established by IDC as part of the Indo-EU Water4Crops (www.water4crops.org) project. 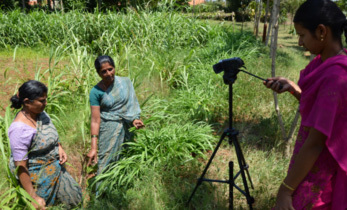 Water4Crops is one of the largest EU-India collaborative projects that aims to address the problems of using untreated domestic and industrial wastewaters for agriculture. The plant, designed and fabricated by Xeon Waste Managers, Pune, Maharashtra, was inaugurated on 17 February. 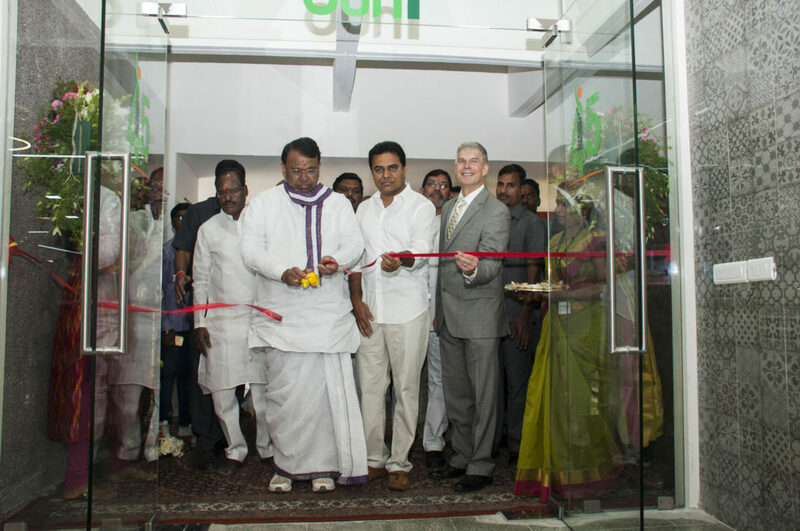 The ICRISAT innovation Hub (iHub), a creative space where agricultural technology entrepreneurs, scientists and experts can collaborate to innovate cutting edge ideas for smallholder farmers, was inaugurated at ICRISAT-India. “This is very important for the welfare of farmers. We have to enhance farmers’ incomes. Seventy percent of people in India are in agriculture and most of them are dependent on crop loans. I want to see farmers able to reduce their investments, increase productivity and yield with good rates, so they do not have to go for loans every year,” said Mr Pocharam Srinivas Reddy, Agriculture Minister, Telangana. Mr Rama Rao highlighted that, despite several interventions from the government, agriculture remains unattractive to youngsters as the sector is non-remunerative. According to him, this is an area which agricultural and technological innovation can target. “Entrepreneurs with passion are the ideal individuals to tackle problems using innovation and drive conversations at the intersection of agriculture, finance and IT. 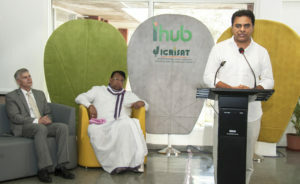 Promoting such intense collaborations between entrepreneurs and ICRISAT scientists is at the heart of the idea of iHub. We have already launched an International Agricultural Innovations Program with T-Hub and many agritech startups have shown interest in collaborating with us,” said Dr Bergvinson, Director General, ICRISAT. In this context, Dr Bergvinson emphasized on tailoring interventions and targeting knowledge for smallholder farmers to address their ambitions and aspirations of life which will then motivate them to follow those recommendations leading to technology adaptation. To enhance and strengthen the strategic vision for iHub, a high level advisory council has been set up, comprising: Jayesh Ranjan, Principal Secretary for IT, Telangana; Anil Bhansali, Managing Director of Microsoft, India; Rama Iyer, Senior Vice President of T-Hub; Praveen Rao, Vice Chancellor of Professor Jayashankar Telangana State Agricultural University; BVR Mohan Reddy, Executive Chairperson, Cyient; C Parthasarathi, Principal Secretary, Agriculture, Telangana; David Bergvinson, Director General, ICRISAT and convener Ram Dhulipala, Lead, Digital Agriculture and Youth, ICRISAT. The iHub spread over 10,000 sq. ft. includes a 40-seater accelerator facility. It was inaugurated by Mr Rama Rao and Mr Srinivas Reddy on 13 February. A new project to improve chickpea adaptation to environmental challenges was recently launched at ICRISAT - India. The primary focus is: salinity tolerance, ascochyta blight resistance and drought tolerance. Chickpea production is hampered by several abiotic stresses such as drought, heat and salinity and biotic stress such as ascochyta blight. The effect of abiotic stress is projected to become more severe under the predicted climate change scenarios. India is the world’s largest producer of chickpea. In 2013, the annual production was 8.83 million tons. 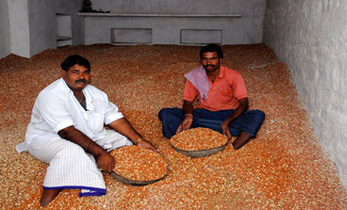 However due to growing demand, each year, India imports large quantities of chickpea. In 2014 India imported 550,790 tons which rose to 865,000 tons during the period of January – September 2015. Australia is the world’s second largest producer of chickpea and majority of Australia’s production is exported to India. “Area under chickpea cultivation has been increasing in Australia and the Australian pulse industry is keen to further enhance the production. However, ascochyta and salinity are major production constraints in Australia. Very recently due to possible change in the pathotype isolate the resistance against ascochyta blight has broken down and there is an urgent need to identify new sources of resistance. Similarly, salt tolerance is also an important trait for Australian chickpea community,” said Dr Tim Sutton, Principal Scientist, Crop Improvement, South Australian Research and Development Institute (SARDI). “We are happy to continue our successful collaboration with Australian colleagues and committed to work for smallholder farmers by providing superior lines with enhanced yield under rainfed conditions, which happens to be the national priority of Government of India,” said Dr Rajeev Varshney, Research Program Director, Genetic Gains, ICRISAT – India. The project titled ‘Improving Chickpea Adaptation to Environmental Challenges in Australia and India’ was launched on 9 February at ICRISAT-India. It is funded by the Department of Biotechnology (DBT), Government of India under the Indo-Australian Biotechnology Fund (IABF) scheme for a period of three years. The project is jointly developed by scientists from Indian Council of Agricultural Research (ICAR) – Indian Agricultural Research Institute (IARI), South Australian Research and Development Institute and University of Western Australia (UWA) and ICRISAT. Dr Tim Colmer, Plant Physiologist, UWA; Dr Pooran Gaur, Principal Scientist, Chickpea Breeding, ICRISAT; and Dr Manish Roorkiwal, Scientist, Genomics and Molecular Breeding, ICRISAT provided feedback on the project and reiterated their commitment to work for chickpea improvement. Improved chickpea varieties with tolerance to drought, salinity and resistance to Fusarium and Ascochyta Blight. New haplotypes for chickpea breeding programs from existing multi-parent advanced generation inter-cross (MAGIC) populations. New markers associated with salinity tolerance that can be deployed in chickpea breeding program. Facilitating Indian and Australian chickpea farmers and traders for enhanced chickpea production and trade. Investor: DBT, Government of India and Indo-Australian Biotechnology Fund. Partners: ICAR-IARI, SARDI, UWA, ICRISAT and partners. 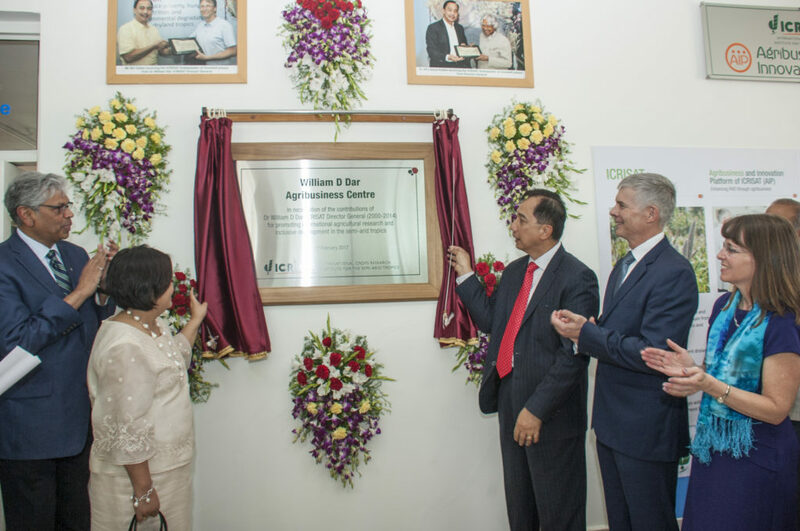 In recognition of Dr William Dar’s 15 years of service and vision of inclusive market oriented development to serve smallholder farmers in semi-arid tropics, the ICRISAT-Agriculture Innovation Platform (AIP) building was named as the ‘William D Dar Agribusiness Centre’. While explaining the rationale behind ICRISAT’s Inclusive Market Oriented Development (IMOD) strategy, Dr Dar emphasized that ‘science with a human face’ was a constant reminder of the strategy and that our science must have a purpose. He further explained the main aspects of IMOD – inclusiveness, innovation, resilience and market effectiveness. “Inclusive development is not just including farmers in creating solutions but including other actors in the value chain. Increasing productivity, driven by demand and instituting competitiveness for them will only come from innovations,” said Dr Dar. World resources are finite and with growing population, “There is need to increase food production by 7-8% and in this relation, the third aspect of IMOD is building resiliency of farming communities. It is a must. Market effectiveness is another important aspect. We need to have a global perspective and understand that innovation and technologies we create must be marketable, also in the future,” said Dr Dar. “Early on, Dr Dar recognized, that it is more than just productivity, we need to bring prosperity and to do that we need to connect farmers to markets. The AIP has been a very powerful catalyst and vehicle to achieve that vision. It is wonderful to see that motto has scaled up to national program here in India and also our partnership with farmers, has reached eight different countries in sub-Saharan Africa and it continues to evolve and adapt to different countries to meet their needs and context,” said Dr David Bergvinson, Director General, ICRISAT. Dr William Dar served as Director General, ICRISAT from 2000 to 2014. Currently, he is the President of InangLupa Movement Inc., which pursues collective and cohesive action towards poverty alleviation, food and nutrition security, and economic prosperity. Dr Chandra Madramootoo, ICRISAT Governing Board Chair, emphasized the need to close yield gaps. Using the example of a study on groundnuts in India, he explained how the gaps between average yields, maximum yields and minimum yields are highly variable, especially when soil stresses are considered. “Along with factoring in biotic and abiotic stresses, I think we need to put our crop breeding research programs in line with risks and business risks, because that is what the farmers are into, they are into this business and they need to manage risks. I think we should re-position and think how we look at our crop breeding strategy in terms of risks,” said Dr Madramootoo. The Global Planning Meeting set aside a considerable amount of time, to review and enhance the existing crop breeding programs, discuss modernization of crop improvement, and strategize how to harness new tools to maximize genetic gains. Innovation systems research was also discussed in detail to ascertain how all the different disciplines in crop improvement, innovation systems and other global and regional programs can work together to contribute to ICRISAT’s mission. Specific case studies on: scaling up climate-smart agriculture, watershed management innovation and crop-livestock market were presented and discussed, to better understand and apply the innovation systems approach to agriculture research. Updates and highlights of ICRISAT’s global research programs were also presented by the respective research program directors. To generate innovative research ideas, a ‘team challenge’ was organized during the meeting. Teams were required to come up with one innovative research topic, where the winning team would receive USD 5,000. Eight research ideas were presented, and the winning pitch was from Dr Chris Ojiewo and team ‘A Global Framework of Integrated Seed Systems for Climate Smart Crops’.Second runner-ups were: Dr Tilahun Amede Wondifraw and team, Dr Damaris A Odeny and team and Dr Albert Johannes Gierend and team. Dr Peter Carberry, Deputy Director General – Research, ICRISAT, urged the participants to work as a team, across regional and global programs to deliver impact oriented work that ratifies and supports ICRISAT’s strategy of inclusive market oriented development for smallholder farmers. “We have to ensure that we continue to deliver quality science that has a stand in the international community. We also need to deliver technology that has global and regional impact. We are an applied research organization and our vision and mission is about having impact on the ground and we have to deliver appropriate technology,” said Dr Carberry. Over 212 scientists, managers and administrative staff from ICRISAT’s nine locations worldwide, convened at the 2017 Global Planning Meeting to update ICRISAT’s strategy, confirm 2017 work plans and identify methods to raise the science quality and impacts from research. The meeting took place at ICRISAT-India on 14-16 February. A training was conducted recently to promote the use of improved seeds by smallholder farmers. Participants learned to map seed demand in their area, develop quality assurance systems, explore financial and human resources and develop seed marketing plans. The meeting provided space for different stakeholders to share experiences and discuss challenges in managing their seed businesses. The training also provided technical knowledge of seed production, processing, sampling and testing. In addition, socio-economic skills necessary for partnership development within the seed and commodity value chains were discussed. Participants were informed on the benefits of using information and communication technology (ICT) in inclusive seed business development. This training was jointly facilitated by Dr Essegbemon Akpo, Scientist – Seed Systems Specialist, ICRISAT, Nairobi; Enock Maereka, Seed Business Development Specialist, International Center for Tropical Agriculture (CIAT), Lilongwe; Dr Jean-Claude Rubyogo, Seed Expert, CIAT, Arusha and Dr Monyo S Emmanuel, Consultant and groundnut breeder, ICRISAT, Nairobi. 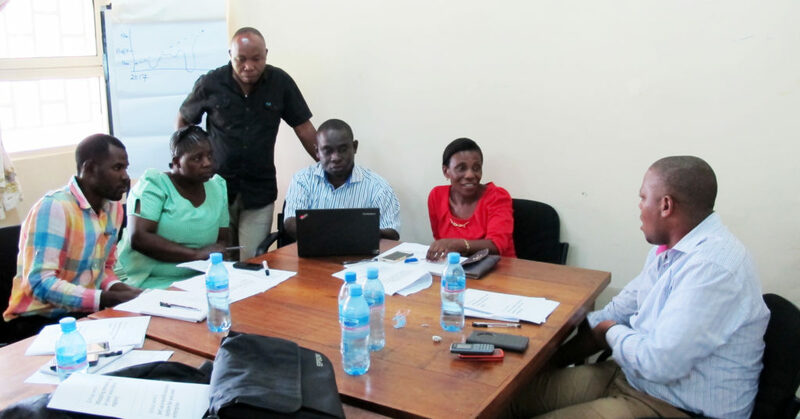 The training was held on 23 – 25 January at the Sugarcane Research Station, Kibaha, Tanzania. It was attended by 26 participants comprising researchers, representatives of public and private seed companies and farmer organizations. Partners: CIAT; International Institute of Tropical Agriculture (IITA); National Agricultural Research System (NARS) in Ethiopia, Tanzania, Uganda, Burkina Faso, Ghana, Mali, Nigeria, India; ICRISAT. A three-day training focused on climate smart agriculture and technologies such as, zaï, half-moon, organic and mineral microdosing, composting, contour bunding and cereal - legume inter-cropping was held recently. Participants were trained on climate information tools developed by Malimeteo (national meteorological agency of Mali). Zaï and half-moon are traditional West African practices to collect run-off water and organic matter in small pits (zaï) or semi-circular basins (half-moons). Stone bunds, zaï and half-moons are land management techniques that lead to improved soil fertility and soil moisture (Zougmoré et al. 2014). “This training will enable the technical actors to have adequate technical knowledge and tools to better advice and train farmers and thus enhance their capacity to adapt to the effects of variability and climate change,” emphasized Dr Ramadjita Tabo, Research Program Director – West & Central Africa and Country Representative, ICRISAT – Mali. Dr Dommo Tembely, Scientist, Natural Resource Management, Institut d’économie rurale, Mali; Dr Abdou Fall, Principal Scientist, Project Manager, International Livestock Research Institute; Birama Diarra, Director of Meteorological and Climate Applications for Malimétéo and Andree Nenkam, Scientific Officer, ICRISAT. The opening ceremony of the training session was chaired by Dr Ramadjita Tabo, Research Program Director – West & Central Africa and Country Representative, ICRISAT – Mali; John Riley, Country Director of International Relief Development and Dr Mohamed Traore, Malian Agency for the Environment and Sustainable Development. 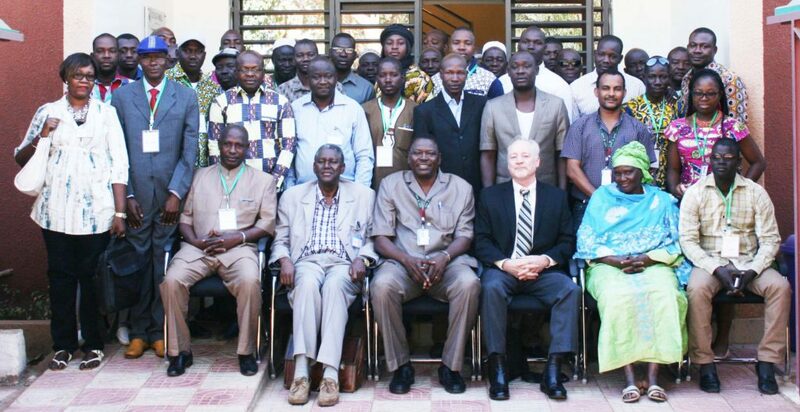 Thirty extension workers from project sites attended the capacity building training held on 24 – 26 January, at ICRISAT – Mali. 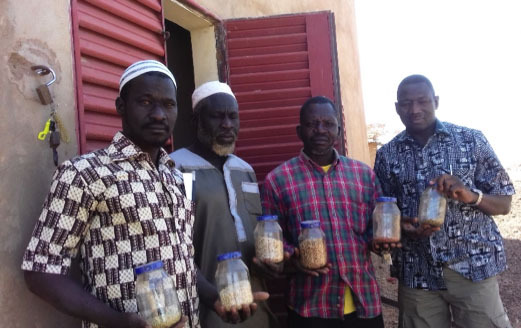 A team from ICRISAT-Niamey genebank, visited a community-led seed bank in Tougouri village. This seed bank is first of its kind in Burkina Faso. During the visit, the team interacted with farmers and expressed interest in collaborating with the seed bank in collection, conservation and regeneration of critical landraces at ICRISAT Sadoré station. The seed bank is an initiative of local farmer groups and is supported by the Plants Genetic Resources Service of Burkina Faso. Thirty landraces are being stored in the seed bank which has a capacity for short to mid-term conservation. The bank also has an underground room, where panicles and pods of groundnut, pearl millet, sorghum and maize are conserved for 2-3 years. 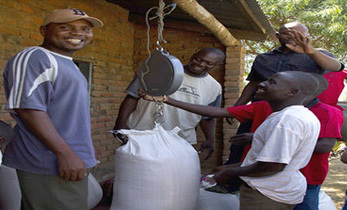 The entire village participates in maintaining, organizing and managing the seed bank. The village elects a committee to take charge of the seed bank’s daily activities. 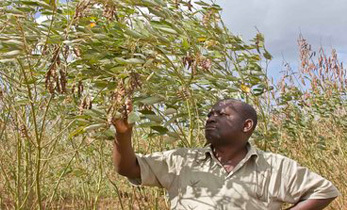 After regeneration, excess seeds are distributed to farmers and priority is given to farmers who contribute to the seed bank. 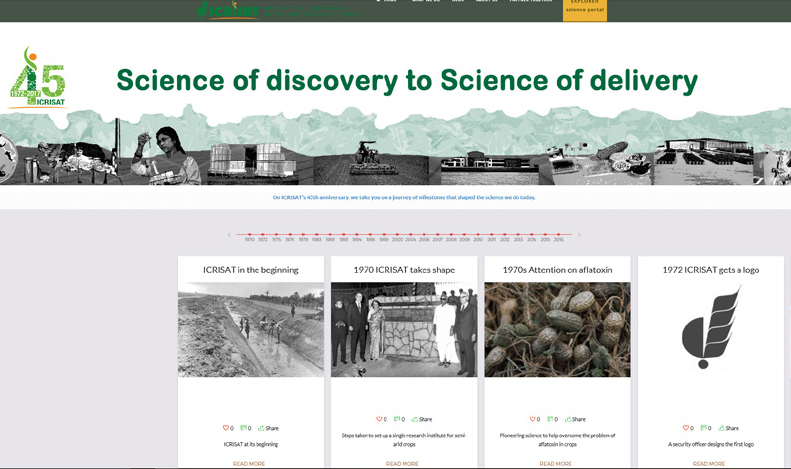 ICRISAT’s regional genebank trains the National Agricultural Research System (NARS) partners in collection, seed multiplication and conservation activities. 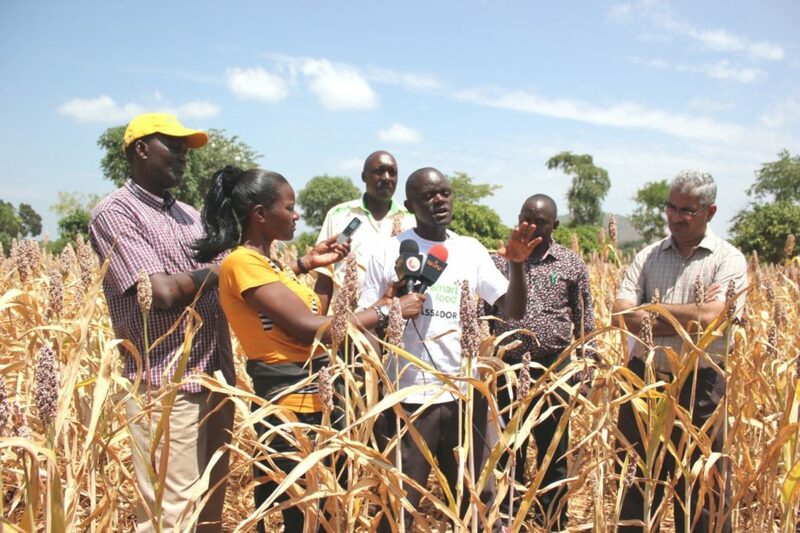 L-R: Dr Eric Manyasa, ICRISAT, Kendi Njeru (Royal Media services), Mbogo, County Agricultural Officer, Chiakariga Ward, Shadrack Kithome, Mutai, ICRISAT and Dr Ganga Rao, ICRISAT.